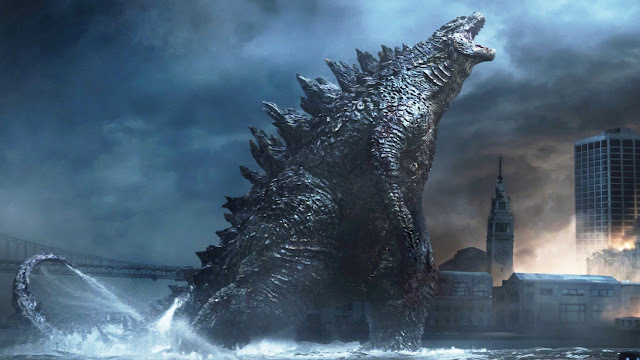 Godzilla about to destroy yet another city that isn't Portland. I haven't yet seen San Andreas, staring Dwayne "The Rock" Johnson. Reading a review I've learned the filmmakers destroy not one, but two, cities. I would be much more excited to see this film if I could choose the two cities that would be destroyed. Seeing Portland destroyed would be neat because I know the skyline and landmarks. Next on the destruction list I would choose Beaverton, Oregon because it's fairly flat and would probably be overrun with people on cargo bikes delivering emergency supplies. I don't know that the bicycle rescuers would be all that visually dramatic, but the self-satisfied good feeling of those who own cargo bikes would light up the night sky for a beautiful effect.